The addition of 8.4 million subs in Q4 was the company's largest ever quarterly increase. 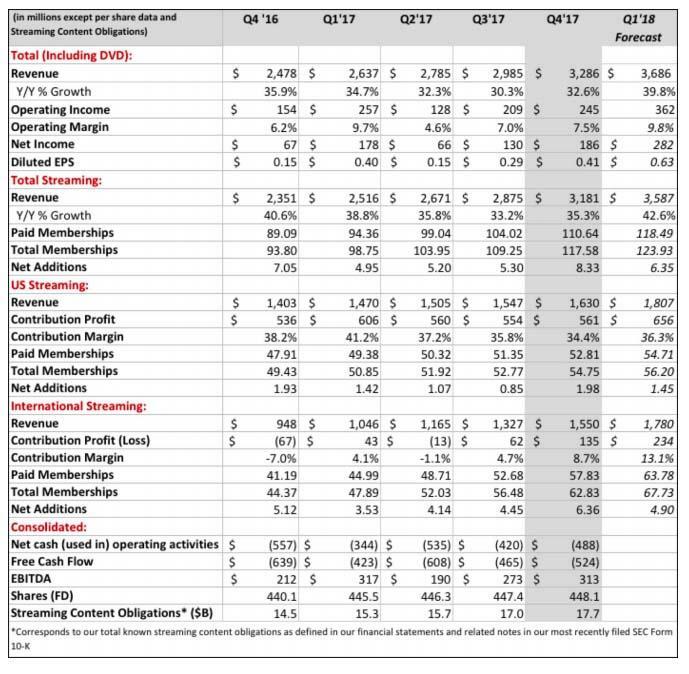 Netflix' Q1 2018 outlook was also far above expectations, with the company now expecting Q1 net streaming adds of 6.35 million (1.45MM in the US and 4.9MM internationally) well above the consensus estimate of 5.18 million, although this will come at a cost: Netflix expect to burn between $3 and $4 billion in cash in 2018. The company expects $3.686 billion in Q1 revenue, also above the consensus estimate of $3.49 billion, generating EPS of 63 cents, above consensus of 55 cents. 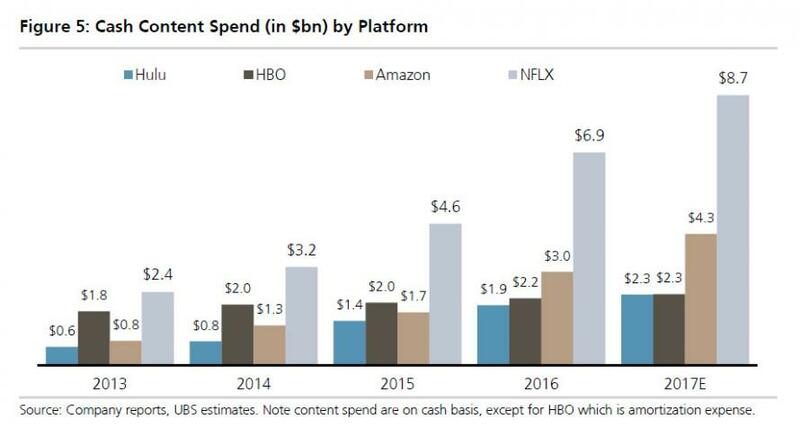 In addition to the stellar subscriber adds, one thing that investors will focus on is the company's content spend for next year, which Netflix is increasing once again: having previously said they would spend $7 billion, they are raising that by as much as a $500 million on the low end forecasting that "we’ll spend $7.5-8 billion on content on a P&L basis in 2018." The previous range was $7.0-$8.0 billion. ... it will continue spending an ungodly amount. Netflix now has 117.6 million subscribers worldwide, but the success has come at a steep price and as of Sept.30, NFLX's total content obligations were a record $17 billion. Also, as one would expect, the company remains in its near-record cash burning ways, reporting that in Q5 it burned $523 million, modestly below the $639 million it burned one year earlier but above the $465 million it burned in Q3. 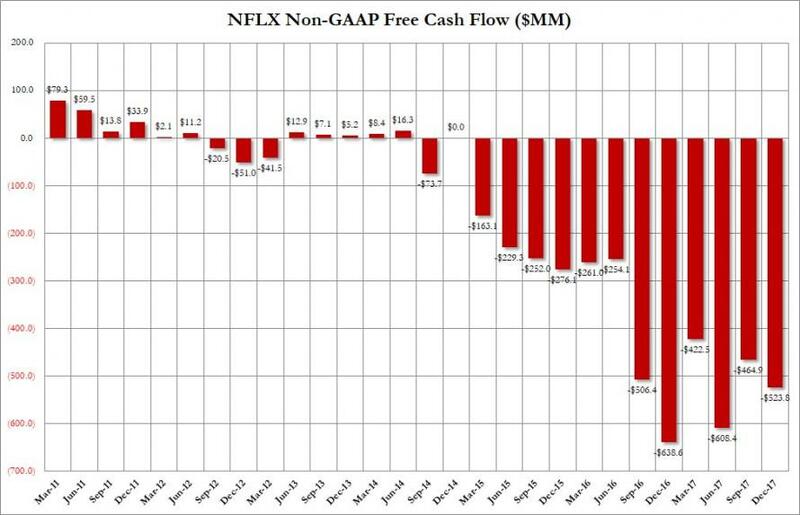 The Q4 burn brought Netflix full year 2017 FCF to -$2.0 billion, "at the lower end of the -$2.0 to -$2.5 billion range we had previously indicated." 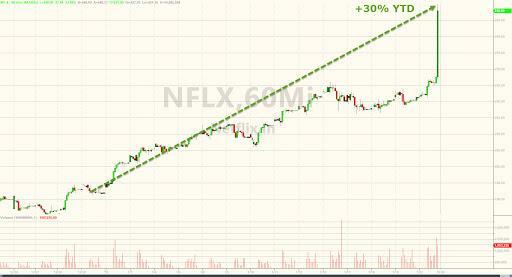 However, this means that FCF in 2018 will jump as Netflix said the calendar effect means content payments "will now occur in 2018." It gets scarier, because as Netflix admits, "we’re growing faster than we expected, which allows us to invest more in original content than we had planned, so our FCF will be around negative $3B-$4B in 2018." While there was no discussion of the Kevin Spacey elimination from the company's House of Cards juggernaut, Netflix did note that it took a $39m non-cash charge in Q4 for unreleased content we’ve decided not to move forward with. In Q4, we registered global net adds of 8.3 million, the highest quarter in our history and up 18% vs. last year’s record 7.05 million net adds. This exceeded our 6.3m forecast due primarily to stronger than expected acquisition fueled by our original content slate and the ongoing global adoption of internet entertainment. Geographically, the outperformance vs. guidance was broad-based. In the US, memberships rose by 2.0 million (vs. forecast of 1.25m) bringing total FY17 net adds to 5.3 million. ASP rose 5% year-over-year. Internationally, we added 6.36 million memberships (compared with guidance of 5.05m), a new record for quarterly net adds for this segment. Excluding a F/X impact of +$43 million, international revenue and ASP grew 59% and 12% year over year, respectively. The increase in ASP reflects price adjustments in a wide variety of our markets over the course of 2017. Domestic contribution profit increased 5% year-over-year although contribution margin of 34.4% declined both on a year-over-year and sequential basis due to the marketing spend we noted in last quarter’s investor letter. With contribution profit of $227 million in 2017 (4.5% contribution margin), the international segment delivered its first full year of positive contribution profit in our history. For Q1, we project global net adds of 6.35 million (vs. 5.0m in the year ago quarter), with 1.45m in the US and 4.90m internationally. As we wrote last quarter, our primary profit metric is operating margin and we are targeting a full year 2018 target of 10%, up about 300 basis points year over year, as in the prior year. We believe our big investments in content are paying off. In 2017, average streaming hours per membership grew by 9% year-over-year. With greater than expected member growth (resulting in more revenue), we now plan to spend $7.5-$8.0 billion on content on a P&L basis in 2018. We’re taking marketing spend up a little faster than revenue for this year (from about $1.3B to approximately $2B) because our testing results indicate this is wise. We want great content, and we want the budget to make the hits we have really big, to drive our membership growth. We’ll grow our technology & development investment to roughly $1.3 billion in 2018. We have been talking about the transition from linear to streaming for the past 10 years. As this trend becomes increasingly evident, more companies are entering the market for premium video content. On the commercial-free tech side, Amazon Studios is likely to bring in a strong new leader given their large content budgets, and Apple is growing its programming, which we presume will either be bundled with Apple Music or with iOS. Facebook and YouTube are expanding and competing in free ad-supported video content. With their multi-billion global audiences, free ad-supported internet video is a big force in the market for entertainment time, as well as a great advertising vehicle for Netflix. Traditional media companies are also expanding into streaming. Disney is in the process of acquiring most of 21st Century Fox and plans to launch a direct-to-consumer service in 2019 with a beloved brand and great franchises. The market for entertainment time is vast and can support many successful services. In addition, entertainment services are often complementary given their unique content offerings. We believe this is largely why both we and Hulu have been able to succeed and grow. Our operating margins and income are rising, and our only material cash-ahead-of-P&L-expense is content. When we develop a title like Bright, the cash spend is 1-3 years before the viewing, associated membership growth, and P&L expense. Thus, the faster we grow our originals budget (particularly for self-produced content), the more cash we consume. We are increasing operating margins and expect that in the future, a combination of rising operating profits and slowing growth in original content spend will turn our business FCF positive. In the near term, however, membership, revenue and original content spend are booming. We’re growing faster than we expected, which allows us to invest more in original content than we had planned, so our FCF will be around negative $3B-$4B in 2018. Given our track record of content investments helping to increase growth, we are excited about the growth in future years from the increased investments we are making in original content this year.